Today is our last day in Patagonia before moving on to Iguassu Falls (warm! tropical!) via a day back in Buenos Aires tomorrow. We spent the night in a nice hotel in El Calafate, as I mentioned yesterday, and awoke this morning to cloudless skies and a crisp beginning-of-winter bite in the air, plus dusting of snow on the ground, cars, rooftops, and of course the distant mountains. But it isn’t winter: this is what passes for springtime here. It hardly matters; as I’ve already mentioned, the weather changes dramatically about every 20 minutes. Our goal today was Perito Moreno glacier, a significantly larger chunk of ice than those we have see so far. (My previous posts misspelled the name with too many R’s.) It is one of several enormous glaciers that fill a strip roughly 10 miles wide and 100 miles long, running north-south along Argentina’s border with Chile and collectively comprising Glacier National Park. The temperature was brisk, probably around 40F, and the wind typically ferocious, blowing so hard that it was very difficult to hold the camera steady enough to take pictures. The hillsides were dotted with sheep, and this (being spring) is lambing season, with lots of young frolicking around, or at least frolicking as much as one can in weather like this. We were grateful for the sun. We made a brief stop at a small estancia, which had a cozy little restaurant and café. It was owned by a Basque family; for reasons that are not altogether clear to me, Argentina has a significant Basque enclave. But Basque they are, and if you don’t believe me then take a look a look at the portrait at left that I took of one of one of the owners, and tell me that he does not look like everyone’s idea of a Basque. The house had a couple of nearly newborn lambs running around (inside the house), and the restaurant was heated by a wood burning stove, so the operative word was “rustic”. (The bathrooms were fully modern, happily.) The scene went momentarily crazy when one woman in our group — one of the “Boise girls” — stood too close to the stove while still wearing her quilted down coat. One side of the synthetic coat instantly melted, releasing a large cloud of down feathers that swirled around the room on the air currents from the stove. Chaos erupts! Everyone who didn’t see it happen suddenly wondered why it was snowing tiny feathers indoors. The baby lamb went crazy, chasing after the floating white whisps, apparently under the tragic misapprehension that its mother had exploded. The owners happily took the disaster in stride, sweeping up the feathers and patching the afflicted coat with — wait for it– duct tape. That is a narrow ice-choked river in front of the glacier, connecting the two lakes at whose junction Perito Moreno sits. As usual, the perspective in the photo gives a deceptive sense of scale, since the walkway is in the foreground, nearly 1000 ft in front of the glacier. The ice wall is 200 ft high, and the full width of the face (you see maybe 1/4 of it here) is about 3 miles. It also extends something like 8 miles into the distance, which means that from the initial distant vantage point at the park entrance you are looking at something like half a cubic mile of ice. And this is just one of the glaciers in the park, the most accessible but not the largest. The path itself is a relatively recent addition, constructed in the late 1980’s. Prior to then, you could walk all the way down the hillside to the river in front of the glacier, and if the river was frozen you could walk the few hundred feet across it and actually touch the face of the glacier….at which point several tons of ice would fall on top of you, thereby spoiling the fun. Remember how I reported that we saw calving events on all the glaciers we saw? This one is no exception, and after losing about two idiotic tourists per year over a 20 year period starting in the 1960’s, they finally built the walkway. I said DON’T WALK ACROSS THE RIV…oh, never mind. We’re having fun! We’re freezing! We walked a number of the paths, spending about 2 1/2 hours gawking at the glacier from various vantage points. It was spectacular and a fitting end to our Patagonia sojourn before we move on to warmer climes. Tomorrow is a travel day and unless something exciting happens in Buenos Aires I may not post anything until we get to Iguassu Falls. (Or, being longwinded, I might.) So I will close this entry with the photo of the two of us (right) enjoying the comfort and convenience of the six layers of clothing we are wearing against the wind and cold. But hey, it’s a GLACIER! Awesomeness quota fulfilled. Postscript to yesterday’s entry: the ship’s navigation map went at auction for $400 to a very determined elderly Australian lady. She started the bidding at $200 and the room went silent for about five minutes as every other potential bidder cowered under their respective chairs. Finally, after repeated pleading by the auctioneer one brave Chilean gent tentatively hazarded $220, at which point the Aussie iron lady leapfrogged her own bid all the way to $400, and that was that. And so on. She then goes on to say that she should have married Marvin like mother wanted, and it turns out that he is Marvin and she never realized it because they all look alike. In any case, here’s the crowd on the beach (above right). And here is Marvin, at left. Or at least, I assume so. There is in fact no easy way to differentiate male and female penguins unless you are either an ornithologist working up close, or another penguin. I should mention the sounds of the island. First and foremost, as you might guess, is howling wind. But competing with that sound for attention was the vocalizations of the tuxedoed sea of penguins: they hoot, they squawk, and — in a bit of déjà vu for us — they bray. Almost exactly a year ago we saw the Boulders penguins of Cape Town, South Africa, which for good reason are informally called “jackass penguins”. Much like them, the Magellan penguins make a loud and unmistakeable HEE HAW, pointing their beaks straight up to the sky, swelling their throats, and letting loose. The island, like most of Tierra del Fuego, has a fragile ecology. To protect it, i.e. to avoid an Exxon Valdez kind of disaster and countless petroleum-covered penguins, the Chilean government forbids tanker ships from using the Strait of Magellan. They have to sail to the southwest in the open Pacific, where weather conditions are even harsher. We stayed on the island for an hour or so, exposing every uncovered inch of ourselves to the gale-force freezing wind. The Zodiac ride both to and from the Australis was choppy and wet, and based on that experience we are both able to testify from personal experience that the Strait of Magellen is filled with very salty water. This having been a sunrise excursion, we were back on the ship by about 8:30 AM and enjoying the very good breakfast buffet just a few minutes after that. The Australis weighed anchor while we were eating, and we docked in Punta Arenas about two hours later, bringing the sea leg of our trip to a close. We cleared customs in Punta Arenas — remember that we boarded ship in Ushuaia, Argentina and are now re-entering Chile — and boarded a bus for a brief city tour before lunch. Punta Arenas is Julio’s home town, though his job as a tour lead does not give him much time at home. He introduced us to our local guide who, remarkably, turned out to be his father! Punta Arenas is an attractive medium-sized town with a population of about 180,000. It has a small, pleasant central square surrounded by wind-twisted trees, and whose main feature is a statue commemorating Magellan. Many of the buildings are quite elaborate, colonial-style mansions that were once private residences of the wealthy but are now mostly government buildings and museums. Its glory days are somewhat past; up until about 1960 the region was dominated by a small number of robber-baron-type families, notably the Menendez family that at its peak owned fully 10% of the land in Patagonia. But the real slide began well before then, with the completion of the Panama Canal. Up till then, of course, every cargo and passenger ship moving between the east and west coasts of North America had to go around Cape Horn, and Punta Arenas was a major stopover point on that route. When the canal opened, Punta Arenas’ raison d’être pretty much evaporated. Our bus took us to a rustic-looking but actually modern and comfortable asador (wood-smoked barbecue) restaurant located next to a small horse farm at the edge of town. Lunch was an excellent mixed grill of chorizo, chicken, all cooked over a wood fire in the same room in which we ate. We hit the road at about 3 PM (meals are a leisurely affair here) for the two and a half hour drive to our hotel. The terrain is flat and mostly empty — we are in the pampas now — but giving way to rolling hills in the distance. There are few people; this part of the country has an average population density of fewer than 5 people per square mile. The ground cover is yellowish grass, low bushes, and very small trees. This vegetation is of poor nutritional value, hard to digest because of a high silica content, but nonetheless hosts an interesting variety of life. Within the first hour of the bus ride we saw a flock of sheep and, far more interestingly, a flock of Chilean flamingos like the ones we saw in Atacama; a caracara, which is a puffin-like raptor about 16″ tall; and several rheas, which are very large brown emu-like flightless birds about two-thirds the height of an ostrich. In our continuing series of Glaciers of Patagonia, today we bring you Piloto Glacier located at the head of Alacalufe fjord here in not-so-sunny Patagonia. But first, we had to get there. 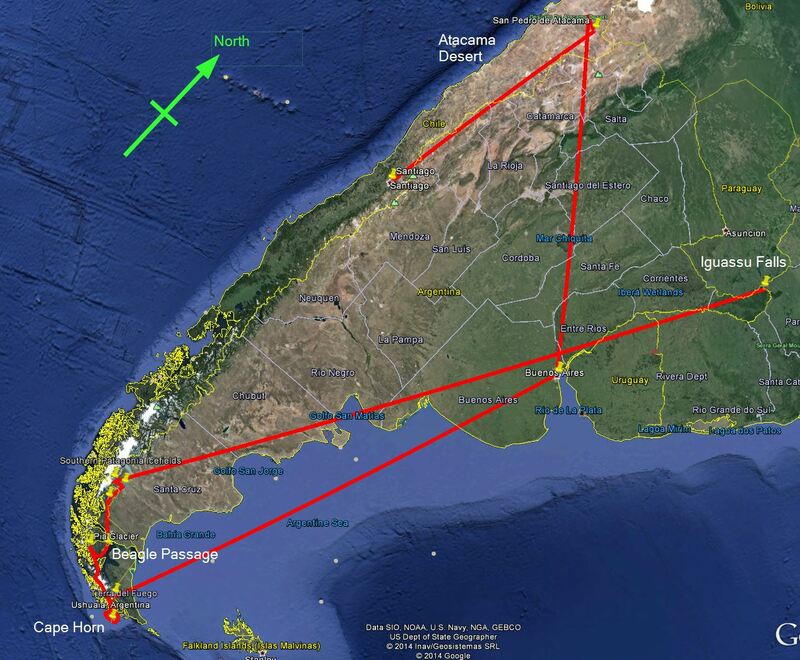 Late last night we exited the Beagle Passage on the Pacific side of Tierra del Fuego. We were warned at dinner that this would be the windiest part of the passage with the highest waves — this part of the Pacific is anything but pacific (with a lowercase p) — and that for this reason the passage would be made late at night when we were safely tucked into bed. They elaborated that it might be hard to move around the cabin during this time, which turned out to be spectacularly true. Up to this point the seas have been quite calm, and the motion of the boat correspondingly gentle, even soothing. But I awakened in the middle of the night to use the bathroom, and it took me about a minute to get to the bathroom, which is about eight feet from the foot of the bed. I could hear the wind howling outside the window, and even lying in bed felt like a roller coaster ride, with momentary periods of near-weightlessness followed by an abrupt thud and crash as the bow of the ship pitched down from the crest of a wave into the trough. It was remarkable, and after navigating back to bed from the bathroom, a journey that took another minute or so as I weaved around the pitching and rolling floor, I opened the curtains to watch the show outside for a while. (I chose not to wake Alice, who was still sound asleep.) The boat has running lights on the side so it was possible to see the waves from the window, and there was faint moonlight filtering through the heavy clouds, illuminating the island on our starboard side. It was quite the display. At this point a number of you might be saying, “I’d never make it through the night because I get seasick really easily.” But the powers that be have thought of you, and it is not for nothing that the passage was in the middle of the night: you don’t get seasick in your sleep. In the event, by morning we were back in calm seas at the mouth of the fjord. This excursion would not involve landing the Zodiac; we would remain in it to motor up the glacier and approach as close as we safely could to the face of Piloto while the Australis remained at anchor at the mouth of the fjord. Since we would not be doing much moving around we are advised to layer up as much as we could; the weather would be cold, wet, and raw, and absent any hiking we would not be keeping ourselves warm. So we suited up like brightly colored Michelin Men. The air temperature was about 40 F, and the water temperature about the same. The wind was modest and it was raining lightly but steadily. Apparently in anticipation of our arrival, Piloto glacier had a major calving event a few hours earlier, and the fjord was choked with ice to the point that it appeared as though you could practically step out of the boat and walk down the channel. (We were advised not to try this.) The Zodiacs struggled against all the ice; you can see two of our four boats in the photo at left, practically locked in the ice. There were, needless to say, the expected Shackelton jokes. As in yesterday’s photos of Pia Glacier, the perspective in this shot is very deceptive because the boat is much closer to the foreground than the glacier, which is several hundred feet high. We maneuvered around the floating ice to get as close as we could, ignoring the pelting rain and trying to avoid being hemmed in by the floes that completely surrounded us. And while we were ogling the blue giant, it put in another show for us, calving once again with a lightning crack and thunderous explosion, and bringing our calving record to 3-for-3. I caught part of the event on camera; you can see it right in the middle of the picture below, resembling a waterfall on the glacier face. But it is actually a huge “icefall”, a good 100 ft high. We lingered for a while longer to see if any more would fall, but only a small amount did so we turned around and made a short stop to admire the bird life: gulls, skuas, and lots and lots of crested cormorants, the latter perched in rows on the cliff sides among their nests and squawking and dancing (mating dances) at each other. Here they are at left. One peculiarity of their behavior is that they steal building material from each others’ nests in order to improve their own. This tactic works pretty poorly, because while Joe Cormorant is off stealing some sticks from Bob Cormorant’s nest, his nest is in turn being raided by Harpo Cormorant. So when not out hunting for fish these guys basically spend all day either dancing to woo women or picking each others’ pockets. In part because of the rain and also because the (barely) above freezing temperatures cause a lot of glacial melt, the dark granite walls of the fjord were decorated with a multitude of waterfalls. As we motored back up the channel towards our starting point,mew stopped along the way to get close to a couple of small cataracts (whose waters, were, well, as cold as ice). They ran in rivulets of varying width from all the way at the tops of the cliffs down to the sea. After returning to the Via Australis we were warmed with a cup of hot chocolate (with optional whiskey added, which we declined). A few minutes later we were offered a tour of the engine room, which of course appealed to the geek in both of us. It was pretty unprepossessing, far from the cavernous space housing rows of diesel behemoths that you would find on a big cruise ship. This was far more modest,mid deafeningly loud; they gave us earmuff-style ear protection while we we in there. And of course they gave us statistics: two 850 horsepower Diesel engines, two 385 kW main generators plus a 120 kW backup, ship is 237 ft in length, etc., etc. It was interesting and enjoyable enough, I suppose, but suffered from comparison to the one-hour adrenaline rush we had just experienced. Our afternoon shore excursion was to the Aguilar glacier, which unlike either the Pia or Piloto glaciers empties out onto a small alluvial plain, meaning that we could walk nearly right up to it. The Zodiacs dropped us off on the rocky beach, and we hiked along it for about 45 minutes until we came to the mouth of the plain; the glacier was perhaps a quarter mile inland from there. It does not have a recent history of calving and so viewing it was a somewhat more passive experience than the others, but it was nonetheless gratifyingly blue and carved into arches and spires. The weather for this afternoon excursion was not quite as cooperative as it had been; though the temperature was not horribly cold (low 40s), there was a steady pelting rain that made the Zodiac ride and subsequent hike very wet affairs. We were well equipped with all the requisite layers of clothing that we had brought for the trip, notably our happily waterproof top-to-bottom rain gear. Even so, the hot post-excursion shower in our room was a little slice of heaven. And here’s a panorama of Aguila just because. For scale, it’s about 500 ft high. Tonight is our last night aboard ship, with a farewell dinner and some late night activities, notably auctioning off the ship’s official navigation map showing our route and the various waypoints. In the past this has gone for insane amounts of money, the highest that Julio can recall being $800. So we won’t be bidding. We have a morning excursion to a Magdalena Islland, home to a large population of Magellanic penguins. Be on the lookout for excessively cute photos as we then proceed to Punta Arenas to resume the land portion of our journey. The weather has been cloudy with some light misting rain all day, the mountaintops shrouded in fog. But the glaciers are down at the sea and our visibility is unimpeded. The Australis is working its way down the Beagle Channel into the ice fields, and as we approach the glaciers the sea around us is densely littered with floating chunks of ice ranging in size from “cantaloupe” to “minivan”. Many of the larger pieces have been sculpted by wind and water into gently curving baroque shapes, and some of them have football-sized chunks of rock embedded in them. We push slowly through them, and since our cabin is on the bottom deck we can hear frequent thumps as the larger pieces brush against the ship’s hull. The water is dark gray and the floes range in color from light gray to sky blue…glacier blue, I suppose, a striking and incongruously cheerful hue against the cold and light drizzle. The Zodiacs have pretty tough hulls themselves, the inflatable rubber sides being thick enough to repel collisions with small objects. Even so, a scout crew always goes out first to ascertain the safety of the surroundings before we board our own boats. You can see one returning, below. Note that the boat has a rope mesh at the front. This serves two purposes, one being a hand grip for beaching and shoving off, the other being a wave-breaker-upper (for lack of a better term); waves that splash into the front as we motor forward get dissipated on the mesh, which thus minimizes the amount of water splashed into the boat. We had come in sight of our first destination, Pia Glacier, an hour or two earlier. It’s a massive thing whose scale is difficult to appreciate against the mountains that surround it. Here’s the approach to the glacier from abovedecks. You can also see all the ice “debris” in the water around us. To give you an idea of the scale, the mouth of the glacier is about 3/4 mile wide, and it is about 1000 ft high. Today was not quite such an early day, and we set off in the boats at about 9 AM, motoring first directly alongside the Australis and then powering out into the open channel. The driver steers clear of the larger floes but we run straight over the little ones, feeling the bumps and thumps as they run across the bottom of the craft. The beach landing is easy once we navigate the ice; the slope of the beach is gentle and the crew is waiting with a little aluminum gangplank that they hoist onto the bow of the Zodiac for us. We exit the craft one-by-one with striking efficiency and then walk up the sloping granite “beach” to an assembly point. The granite is interesting in itself. Nearly black in color and striated with gray and white, it’s surprisingly skid-proof even when wet; we can walk on it very easily, even on a slope. There are patches covered with white, green, and occasional orange lichen, and there are large exceptionally flat areas maybe 20 ft on a side that are covered with scratches and striations all running parallel to one another — scars on the rock from the glacier’s ancient retreat. And there is sound, lots of it. Loud cracks and pops like gunfire, and the occasional small explosion as some unseen mass of ice breaks off and falls somewhere onto a jagged surface, also out of sight. A lot of the cacophony seems to emanate from the cavelike formation that you can see on the left side of the picture. Every now and then we can see and hear a piece fall from the roof of the arch into the water; the smallest of these is about the size of a car and it makes a deep and thunderous >>FOOM!! !<< as it crashes into the sea. These events seem to occur with increasing frequency even as we watch, making us wonder whether there will be a larger calving event later (answer: yes). There’s a viewpoint at an elevation of a few hundred feet on the hillside, and so we set out along a hiking trail. The weather is holding: heavily overcast and cold but not too raw, with the barely-there drizzle kind of coming and going. The hiking trail is as steep as yesterday’s, but not as long; there are short muddy stretches but tree roots are a bigger impediment, and there are uneven hunks of granite interspersed with the roots and the mud, so we have to pick our way. There are a couple of particularly steep stretches with rope strung along the edge of the path, such as it is; we use the ropes to help haul ourselves up, and we reach the lookout in about 20 minutes. And so here is Alice at the lookout, doing her best Vanna White imitation to present the glacier to you. Even as we watched from the lookout, the rate of explosive pops and crackles from the left part of the glacier seemed to be increasing. So we waited — I’d like to say patiently, but we were anything but — and were rewarded, as the entire ceiling of the arch came loose with the crackling sound of a dead tree being splintered by a lightning bolt. This was a slab of ice bigger than a football field, and it seemed to fall in slow motion. Perhaps 4 seconds in free fall, it hit the water like an earthquake, sending a tiny tsunami towards the Zodiac and washing dozens of boulder-sized floes up onto the beach. We all clapped and cheered. Alice had been on the ball and caught it on video; we’ll post it upon our return. Not everyone in our party had made the hike to the lookout, so when we returned to the beach we regaled the unfortunates with what we had witnessed. We were still hopped up on adrenaline by the time the Zodiac came to ferry us back to the Australis, though we had passed the time productively by drinking hot chocolate and variously chewing and licking a hunk of glacier that had washed up onto the beach, and which I had picked up and brought back to the group for inspection. After all, how could you not want to taste a glacier? I can report that it tastes a great deal like a hunk of ice, quite cold and fresh with no chlorine or additives of any kind. It was kind of neat to both hold and behold, though: you could see strata in it from various formative snow depositions over the years, and it had a lot of suspended air bubbles. This particular chunk was not blue, however. We dodged floating ice all the way back to the ship and enjoyed a buffet lunch (assorted Italian dishes today, quite good) in preparation for the afternoon excursion to our next glacier, called Garibaldi. Most of our group, including ourselves, elected not to go ashore for this one since we were told that the hike was quite arduous and the reward at the top (a waterfall) not altogether commensurate with the effort. This was a wise choice,mat least for us: while the shore party(only 7 people, including the father and daughter from our group) was doing the hike, the captain took the Australis further up the channel nearly up to the face of Garibaldi itself, an enormous ice wall much bluer than Pia though slightly smaller in size. It is about 1500 ft wide and 500 feet high. The channel was practically choked with ice, which we pushed slowly through for a spectacular view. That’s the impact billowing at the waterline just to the right of center. You can also see how very blue Garibadi is, and how very clogged the channel is with small ice floes. And of course you can also see the moraine making a dark S-shaped channel through the glacier. We spent most of the rest of the day congratulating ourselves on our glaciological luck. At 6 PM there was a knot-tying demonstration at the bar/observation deck, which was a lot more entertaining than it sounds. The lesson was given by the boatswain, a beefy guy with a shaved head who could probably have a second career as a nightclub bouncer. He was a hoot, at least in translation by another crew member since he himself spoke little English. And I am proud to say that for at least the next 24 hours until I forget how, I know how to tie a bowline knot as well as a “novelty” knot called a “devil’s staircase”. This is a sort of a trick whereby with a few economic motions you simultaneously create multiple knots at a time strung along the length of rope like beads on a string. As nearly as I can tell its practical application is for wowing guests at very dull parties. But I am confident that I will be able to amaze the kindergarten crowd at, say, our grandson’s fifth birthday in 2 1/2 years. The big unknown about our reaching Cape Horn was whether we would actually be able to stand at the fabled point itself or merely view it from the boat, the determining factors being weather, weather, and weather. (More accurately, the factors would be wind, waves, and beach conditions. Rain and snow are not considered unless extreme.) From the Australis we could already see the Cape Horn monument atop the island, silhouetted against the dawn: a 15′ tall metal square, standing on one corner, with an albatross-shaped hole in the middle. But we got lucky, as the day dawned partly sunny and the swells, though very noticeable, we’re not too high for safety in the Zodiacs. We were warned about a number of things, starting with clothing: wear every layer we had (we were told); the weather is ferociously changeable. Truer words were ne’er spoke. We received our instructions for entering and exiting the Zodiacs, climbed in when instructed, and away we went though the chop and into the wind. There was uncharacteristically no rain, though that would change as predicted; the weather here is spectacularly, dramatically volatile. We motored through the chop and beached at the bottom of a very long flight of precarious wooden steps up the cliff side, something like 156 of them as you see at right. It was a long, steep way up, exciting not only for the reality of where we were but for the more prosaic fact that the steps were rickety and slippery, and it was an awfully long tumble down to the rocky surf below. The Chilean navy station at the top marked the prelude to another climb, this time much shallower over a long wooden boardwalk with a few step risers along the way, wending its way over scrubby grass and stunted trees and up some hillocks to a vantage point fro which we could get a view, not only of the sea and snowy peaks behind us, but of the monument itself and a small lighthouse on a promontory nearby. The scene was striking in its own right, amplified by the increasingly hellacious wind that tore into us now that we are atop the unprotected bluff. It is fortunate that our trip leader Julio had managed to pull a few strings to get us out on the first Zodiac, because we and the other ten folks in our Zodiac thus had the place to ourselves for a few minutes, and it was kind of exciting to realize that we were nearly alone at the this very point, which is the well-and-truly actual southernmost anything outside of Antarctica itself, about as close to the actual end of the Earth as you can really be. No doubt about it, it was more than a little cool. And so here we are (photo below) being awesome at this particular bucket list location. Speaking of “pretty cool” the weather — already more than pretty cool in the literal sense — almost immediately turned to “hideous” with genuinely remarkable speed at just about the moment we stepped away from the monument to allow the newcomers to have their pictures taken. Clouds moved in, the temperature dropped like a stone, it started to hail and snow, and in short order we looked like the picture at right. You haven’t really appreciated hail until you have had it driven into your face by a 40 mph wind in near-freezing temperatures. It was like being stung continuously by about 200 angry bees, and it disinclined us to linger too long at the top. In fairness I should say that this assignment is actually considered an honor, or at least that’s what they tell everybody. But regardless, it seems to me that you better get along with your wife and kid really, really well to avoid thoughts of throwing yourself off the cliff. We made our way back down the rickety and now ice-covered cliffside stairs, squinting against the hail and biting wind while trying not to slip and tumble down all 156 steps. (Our waterproof Wellington boots by this time were doing more harm than good, offering virtually no traction on the rime. Alice slipped and fell 4 times along the way, none of them seriously.) but we were high-fiving to hell and gone by the time we reached the Zodiac for the windy trip back to the Australis, and there were plenty of stories to swap at breakfast at our return (but first…remember to clip your red room tag back onto your life vest!). The storm passed, and the afternoon was markedly milder. During breakfast and lunch the boat had moved a few tens of miles back up the island towards the Beagle Channel, and our afternoon Zodiac excursion was at Wulaia Bay along the way. This was one of the areas where Darwin did some of his research, and it is a striking setting ringed by mountains and dotted by a number of small islands. The island that we docked at (their was a small pier that could accommodate the Zodiacs) was dominated by a ridge about 600 ft above the bay, and we undertook a real workout of a hike to the top of it. We had had three options: an easy hike along the coast, a very strenuous “fast hike” to the the top, or a “moderate to difficult” hike, also to the top. Most people, including ourselves, chose the last. It was no walk on the park. Though we took about 45 minutes to make the ascent — including a couple of pauses for nature talks by the guide — there were parts that were so steep that it was necessary to use a rope strung alongside the trail for assistance. One of the nature stops included a beaver dam, of all things. Fun fact: in 1947 someone who had never heard about rabbits in Australia, mongoose in the Caribbean, or rats in Hawaii had the brilliant idea of importing 25 pairs of beavers from Canada and releasing them in Ushuaia, figuring that in the absence of any local predators they would reproduce without interference and create a whole new industry of lucrative beaver pelts. They got it half right: there is now an out-of-control population of 100,000 beavers living throughout the archipelago…. whose pelts are worthless because it is the hormone-laden oils secreted in fear of the predators that gives them their valuable sheen. For a while the government was paying a $10 bounty on them, but it didn’t help much. Truly, we are in the Golden Age of Invasive Species. Rampant beavers notwithstanding, we huffed and puffed our way to the top — not everyone made it — and our reward was this view. That’s the Via Australis on the water about halfway up and two thirds of the way to the right. Here’s another view, with the ship at lower left. Upon our return to the ship a crew member with a power washer hosed off the bottoms of our shoes. This is done after every island visit to keep our hallway and cabin floors mud-free. The problem with the whole “southernmost” self-image — we drove past a sign advertising “the world’s most southernmost golf course” today — is that unless you are actually in Antarctica you are always on slightly shaky ground. And indeed, there is a Chilean town called Port Williams that is slightly further south than Ushuaia (which is Argentine). But Port Williams has only 1500 inhabitants versus Ushuaia’s 65,000, and so a gentlemen’s agreement — and I swear this is true — was reached whereunder each gets uncontested bragging rights: Port Williams bills itself as the world’s most southernmost town, whereas Ushuaia is agreed to be the southernmost city. Chile and Argentina have a contentious and sometimes bellicose history, so this counts as a small victory for peace. Our main activity on Monday morning was a visit to Tierra del Fuego National Park (proof at right) which in the spirit of things I suppose is the world’s most southernmost national park. The are a number of cool things about the place, but one of them is the entrance sign itself. Note the third line from the bottom, which means “Here is the end of National Route #3”, that being the designation of the Argentine portion of the Pan American Highway. In other words, this sign sign is REALLY the end of the road. There was a little bit of conversational confusion with Laura as she kept referring to “Fire Land”. She was trying to be helpful, since that is the literal translation of “Tierra del Fuego”, named after the fires lit on the beach by the native Yamana and first seen by Magellan. We assured her that we called the place by its Spanish Name. We got back from the park in time to have a late lunch before boarding the ship and decided to go full native in much the same way that we ate a whole fresh king crab for dinner the night before. The local specialty this time was barbecued lamb, and there are a large number of local restaurants dedicated to cooking mammals over wood fires and displaying the process in their windows as at left. After lunch we walked all 16 blocks of downtown, then to the port to rendezvous with our group and board the Via Australis, which you see at right. De boat, boss, de boat! It’s a small, attractive ship that as I mentioned carries about 126 passengers. It has four decks plus an open top deck for panoramic viewing if you enjoy being out in the open in 40 degree weather in a 20 mph wind. The interior is quite beautifully appointed, all dark wood and brass. Our cabin is comfortable, about 11′ x 16′, on the lowermost deck right down the hall from the main dining room. (The rooms are identical on all decks, so lower down is good: less rocking.) One of the ship’s prominent features is not visible in the photo: a row of 4 Zodiacs in the back, to be used to ferry us 12 at a time to islands and glaciers. (As we shall see in our next installment.) Here we are looking back at Ushuaia as we leave port at about 7pm. Note the sterns of the Zodiacs at the bottom. This will be a short post (postscript: apparently not), and definitely our last for at least 5 days and possibly longer since as of tomorrow evening we will be aboard ship rounding Cape Horn and heading up the Beagle Passage to the Patagonian ice fields. It might have struck you that “Ushuaia” is not a very Spanish-sounding name. That’s because it isn’t: it means “westward-facing bay” in the language of the original indigenes, the Yanama. And where are the Yanama now, you may ask? Silly question: remember that the Spanish colonized this place. The natives were wiped out by imported disease, conflict with the settlers, and over-hunting by the settlers of the sea lion population, which was the Yanama’s primary food source. After another dramatic flight over the southern Andes we arrived at about noon today and started exploring the area. The town itself as you can see from the picture looks sort of like a ski resort from the Pacific Northwest, and there is indeed a ski resort here (though the season is just over, it being early spring here). We got lucky on the weather, at least for today: it is partly sunny with temperatures in the low 50’s. We are assured that this is unlikely to last. The wind is extremely gusty, which we are told is typical. Our first stop was lunch at a private home, a beautiful chalet-style house on the hillside overlooking the town and the mountains on the other side of the bay. The hostess and her family (husband and two small daughters) prepared a wonderful lunch — lentil stew with achingly sweet tres leches cake for dessert — and gave us the run of the house so we could chat with the family and admire the view. Afterwards we were presented with the Argentine equivalent of the Japanese tea ceremony, in this sharing the communal pot of Yerba mate. In case you have not heard of it, mate (pronounced MAH-tay) is a very bitter herbal tea made from the Yerba shrub that grows in the northern part of the country. There is a whole social ritual and vocabulary associated with partaking of it; our gracious hostess explained all this whilst preparing it, and we passed around the communal cup while pretending that it did not taste like pencil shavings soaked in motor oil. Good grief, St. Charlie Brown! first is “Gauchito Gil” who lived a virtuous life in the north as a landowner and sort of Robin Hood figure, fighting against the evil Paraguayans and corrupt local sherriff. When finally captured he warned his killer-to-be that if he (Gil) were murderd then the killer’s son would also die. The killer reconsidered and checked up on his son, who was indeed suddenly gravely ill. So he prayed to Gil, his son recovered, and the lesson learned was Don’t Mess Around With The Gauchito. So now Gil’s got big roadside shrines about the size of beach cabañas, all draped in red, which was his symbolic color. The deal is that you offer him some wine by pouring it out of the bottle while making a wish. I’m not sure where any of this occurs in the Bible but we did it anyway. Julio warned us not to wish for good weather because that was probably a lost cause, so Alice wisely asked to be protected against seasickness. At right you can see her making her offering in front of the Big Red Shrine. OK, I think I’ve spent enough words on the local religion, at least the supernatural one. The other local religion — more accurately, one of several national obsessions — is obsessing over the 1982 Falklands War. But you damn well better not call it the Falklands War: those islands are the Malvinas in this country, and no substitute name is accepted. The Falklands/Malvinas were originally colonized by Argentina but conquered by Britain in 1833, and Argentina has been pining for them ever since. Problem is, under standards of international law once you own a place for 150 years it is well and truly legally yours, and the clock was running out. So at the 149 year mark — this is all true — the Argentine government decided to increase its abysmal popularity by making a grab for them, figuring that (a) Britain wouldn’t respond militarily, and (b) the US would support Argentina. Wrong on both counts; Margaret Thatcher wanted to increase her abysmal popularity too. Final score: the British lost about 230 men, plus 100 or so taken prisoner; the Argentines lost 649 men and 11 thousand taken prisoner; and the Falklands are still owned by the UK. Thirty two years later, Argentina is still gnashing its national teeth and trying to think of a clever comeback. And so it came to pass that our last event of the day was an interview with a Malvinas war veteran, a pleasant 50 year old man who served on a naval vessel during that war when he was only 18 years old. His ship was sunk, and 300 men were lost out of a crew of about 1100; he survived in a covered lifeboat for 44 hours with 22 other men, huddled together for warmth. He related his experiences through our latest local guide, Laura, who acted as interpreter. It was interesting to hear, but in the end (a) he was only 18 at the time and (b) c’mon Argentina, get over it already. Dinner tonight was a serious treat: King crab is found in these Antarctic waters, and so we went to a seafood restaurant where you can pick live ones from a tank for steaming, just like lobsters at home. If you have never been to either Alaska or Patagonia then you have probably never had fresh king crab, which is wholly unlike the frozen stuff you get in every store or restaurant or home. It’s like a transcendent experience in your mouth. Dessert was a stroll into a local ice cream store; remember that Argentines do a really good job on ice cream. So all in all a great end to the day. So that’s been our introduction to Patagonia, here in Ushuaia. We’ll be off the grid and o’er the hopefully-not-too-bounding main starting late tomorrow afternoon. I’ll keep up my notes offline and post the batch of them the next time we have Internet access. Till then, our best regards to everyone!